That came true the other day with our Racks adventure. I admit, I was hesitant to enter the place since STEAK for me is synonym to huge bill. 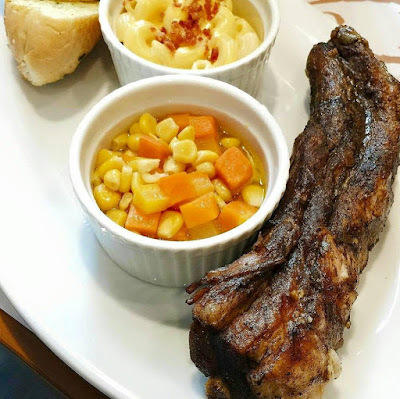 I had Sweet Smokey Quarter Rack which includes two side dishes of my choice. I chose Gravy Fries and Mac and Cheese. The house salad was already included. Jaycee had the Baby Ribs Half Slab which comes with Garlic Bread. He chose Brocolli Cheese and Potato Salad for his side dishes. We also got a pitcher of Brewed Iced Tea for P165.00. I will leave you with a happy tummy! Such huge platters! Yes, I like the picture with the sweet smokey quarter with the house salad! I think I can't eat meat without rice with that huge serving of meat. Hahaha.